Ethereum: GPU Mining Is Back But For How Long? By now, everyone and their dog has at least heard of Bitcoin. While no government will accept tax payments in Bitcoin just yet, it’s ridiculously close to being real money. We’ve even paid for pizza delivery in Bitcoin. But it’s not the only cryptocurrency in town. Ethereum initially launched in 2015 is an open source, it has been making headway among the 900 or so Bitcoin clones and is the number two cryptocurrency in the world, with only Bitcoin beating it in value. This year alone, the Ether has risen in value by around 4000%, and at time of writing is worth $375 per coin. And while the Bitcoin world is dominated by professional, purpose-built mining rigs, there is still room in the Ethereum ecosystem for the little guy or gal. There may be many factors behind Ethereum’s popularity, however one reason is that the algorithm is designed to be resistant to ASIC mining. Unlike Bitcoin, anyone with a half decent graphics card or decent gaming rig can mine Ether, giving them the chance to make some digital currency. This is largely because mining Ethereum coins requires lots of high-speed memory, which ASICs lack. The algorithm also has built-in ASIC detection and will refuse to mine properly on them. Small-scale Bitcoin miners were stung when the mining technology jumped from GPU to ASICs. ASIC-based miners simply outperformed the home gamer, and individuals suddenly discovered that their rigs were not worth much since there was a stampede of people trying to sell off their high-end GPU’s all at once. Some would go on to buy or build an ASIC but the vast majority just stopped mining. They were out of the game they couldn’t compete with ASICs and be profitable since mining in its self uses huge amounts of electricity. Economies of scale like those in Bitcoin mining tend to favor a small number of very large players, which is in tension with the distributed nature of cryptocurrencies which relies on consensus to validate transactions. It’s much easier to imagine that a small number of large players would collude to manipulate the currency, for instance. Ethereum on the other hand hopes to keep their miners GPU-based to avoid huge mining farms and give the average Joe a chance at scoring big and discovering a coin on their own computer. Ethereum’s rise to popularity has basically undone Bitcoin’s move to ASICs, at least in the gamer and graphics card markets. Suddenly, used high-end graphics cards are worth something again. And there are effects in new equipment market. For instance, AMD cards seem to outperform other cards at the moment and they are taking advantage of this with their release of Mining specific GPU drivers for their new Vega architecture. Indeed, even though AMD bundled its hottest RX Vega 64 GPU with two games, a motherboard, and a CPU in an attempt to make the package more appealing to gamers than miners, AMD’s Radeon RX Vega 56 sold out in five minutes with Ethereum miners being blamed. Besides creating ripples in the market for high-end gaming computers, cryptocurrencies are probably going to be relevant in the broader economy, and Ethereum is number two for now. In a world where even banks are starting to take out patents on blockchain technology in an attempt to get in on the action, cryptocurrencies aren’t as much of a fringe pursuit as they were a few years ago. Ethereum’s ASIC resistance is perhaps its killer feature, preventing centralization of control and keeping the little hacker in the mining game. Only time will tell if it’s going to be a Bitcoin contender, but it’s certainly worth keeping your eye on. There is a chain of trust in every modern computing device that starts with the code you write yourself, and extends backwards through whatever frameworks you’re using, whatever OS you’re using, whatever drivers you’re using, and ultimately whatever BIOS, UEFI, Secure Boot, or firmware you’re running. With an Intel processor, this chain of trust extends to the Intel Management Engine, a system running independent of the CPU that has access to the network, USB ports, and everything else in the computer. Needless to say, this chain of trust is untenable. Any attempt to audit every line of code running in a computer will only be met with frustration. There is no modern Intel-based computer that is completely open source, and no computer that can be verified as secure. AMD is just as bad, and recent attempts to create an open computing platform have met with frustration. [Bunnie]’s Novena laptop gets close, but like any engineering task, designing the Novena was an exercise in compromise. You can get around modern BIOSes, coreboot still uses binary blobs, and Libreboot will not be discussed on Hackaday for the time being. There is no modern, completely open, completely secure computing platform. They’re all untrustworthy. The Talos Secure Workstation, from Raptor Engineering, an an upcoming Crowd Supply campaign is the answer to the untrustworthiness of modern computing. 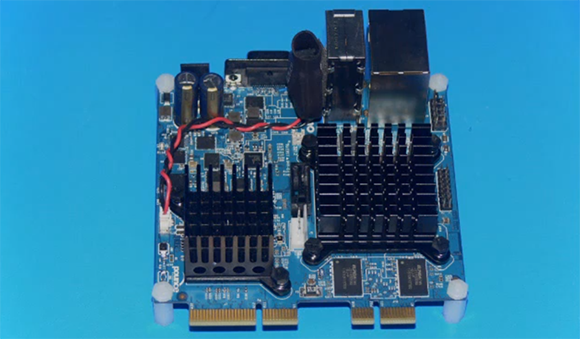 The Talos is an effort to create the world’s first libre workstation. It’s an ATX-compatible motherboard that is fully auditable, from schematics to firmware, without any binary blobs. In 2003, nothing could stop AMD. This was a company that moved from a semiconductor company based around second-sourcing Intel designs in the 1980s to a Fortune 500 company a mere fifteen years later. AMD was on fire, and with almost a 50% market share of desktop CPUs, it was a true challenger to Intel’s throne. AMD began its corporate history like dozens of other semiconductor companies: second sourcing dozens of other designs from dozens of other companies. The first AMD chip, sold in 1970, was just a four-bit shift register. 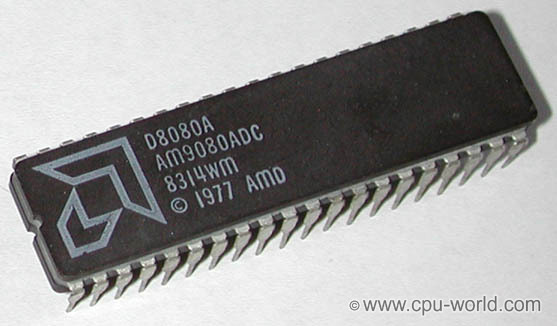 From there, AMD began producing 1024-bit static RAMs, ever more complex integrated circuits, and in 1974 released the Am9080, a reverse-engineered version of the Intel 8080. AMD had the beginnings of something great. The company was founded by [Jerry Sanders], electrical engineer at Fairchild Semiconductor. At the time [Sanders] left Fairchild in 1969, [Gordon Moore] and [Robert Noyce], also former Fairchild employees, had formed Intel a year before. While AMD and Intel shared a common heritage, history bears that only one company would become the king of semiconductors. Twenty years after these companies were founded they would find themselves in a bitter rivalry, and thirty years after their beginnings, they would each see their fortunes change. For a short time, AMD would overtake Intel as the king of CPUs, only to stumble again and again to a market share of ten to twenty percent. It only takes excellent engineering to succeed, but how did AMD fail? The answer is Intel. Through illegal practices and ethically questionable engineering decisions, Intel would succeed to be the current leader of the semiconductor world.